....The book deals with the history of perpetual motion in new light with a new approach. Many historians have attempted to write history of perpetual motion, but there has been no attempt to deal with the history of perpetual motion as an undivided whole or a continuous development as an integral part of development of technology. 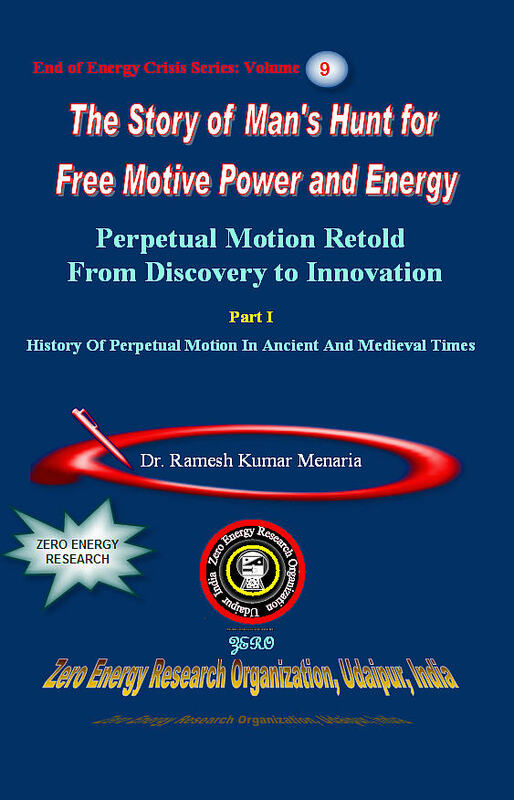 By showing roots of perpetual motion in pre historic times, in religion, in ancient cosmology and philosophy, this book professes to be more than a general survey of perpetual motion, more than mere chronological outline of perpetual motion devices. At the beginning we have devoted a complete chapter that deals with necessity of rewriting the history of perpetual motion and difficulty encountered in such an enterprise. The scholars interested in perpetual motion philosophy will find in Vedic thought an extraordinary mass of material which for detail and variety regarding philosophy, cosmology and astronomy that is based on perpetual motion has hardly any equal in any other part of the world. In Veda idea of perpetual motion gradually unfolds its inner meaning and emerging concepts of perpetual motion from lower level to higher shows a continuity. In Vedas theory is not divorced from practice and real practice of mechanical arts like perpetual motion ensures transformation of nature of man from material to spiritual, from imperfect to perfect, and from manhood to divinity with man in centre and various powers of nature interacting through him. In its methods of presenting perpetual motion, this book also makes first move towards studies of the history, and philosophy, which immediately springs from the necessity of man to invent and adjust to environment. His perpetual desire to control the environment through acquisition of power guides him to perform a large number of activities among which learning secrets of nature by a variety of methods stands supreme. Rituals and magic eventually express his strive towards his own perfection through acquisition of powers equivalent to powers of God. Historians, philosophers, and scientist vie with each other and feels that others are rich in vision but lack some knowledge of his field. To the historian, the scientists lacks perspective and accurate knowledge of history, to the philosopher, the scientists lacks critical skill and depth of knowledge of philosophy, To the scientist, works of philosophers and historians are a great delight but he finds that they presuppose a full knowledge of scientific material and a first hand understanding of nature of scientific work. Being a perpetual motionist, in representing history of perpetual motion, I have tried to seek a balance between all the aspects -science, history, and philosophy of the perpetual motion. The study of perpetual motion is interesting from the perspective of history of science and technology, for it illustrates both the search for a perfect machine and the erroneous development of our modern understanding of the energy principles in physics. Perpetual motion inventors provide a unique case study of human psychology, their ingenuity, persistence and optimism in perpetual motion in the face of repeated failures and suppression on account of ignorance of physicist in perpetual motion is exemplary. History of perpetual motion includes both classical work and less renowned works. In writing the history of perpetual motion, a potentially overwhelming object of study, I have inevitably made much exclusion. I do not have a lot to say about the numerous free energy devices and theory behind them which inventors have proposed to explain their device. While viewing history of perpetual motion as a whole, Ramananda designate perpetual motion as a continuous process that begins in antiquity with invention of tools. The series of activities taking place in perpetual motion are shaped, linked, and guided according to differential needs related to the various aspects of forces and society. Invention of the tools or simple machines, invention of the wheel, its development into windmill, water mill, gears, and clocks and over balancing wheel in course of time, all share common elements, and related to each other, they constitute a continuous spectrum of evolution of man’s intelligence to adapt to the challenges of environment. Undoubtedly invention of wheel is a big landmark in this continuous history. In present times, perpetual motion is identified with invention of a machine, which would work more than equivalent amount of energy supplied to it. Although perpetual motion has been one of the eternal quests of man, his concept of perpetual motion and the dynamics of his quest are moduled according to typical background in which he takes birth and grows. Similarly, it is normal for the individual to be beset with problems of fatigue, work and labours, his perception of the problematic situation, his ways of approaching it, and his modes of dealing with it, are subject to the influence of his philosophical beliefs, cultural values social norms and skills. 1. Process is parallel to the evolution of intelligence. 2. Needs vary with respect to time. Idea or imagination precedes invention. Vedic philosophers were first to sing perpetual motion. Vedic Rishis conceived world as a giant perpetually moving wheel governed by Rita. In Veda, we find a large number of hymns describing numerous perpetual- motions based flying chariots, and feats of Rbhus who were inventors for Gods. The final section of this volume focuses on the important question of whether the idea of "laws of nature" was to be found in Vedic scientific thought; Ramananda answers in the positive, maintaining that the tradition recognized "Rta" within nature as “laws" governing the world. 1. Prehistoric man gradually learned to harness natural forces and exploit mechanical advantage through invention of various tools. 2. Philosophers first conceived perpetual motion as principle of eternal change in nature. 3. Indian Astronomers conceived perpetual motion in the form of celestial motions of heavenly object that was perfect. It symbolized order, beauty, and symmetry. They proposed design of a mercury driven perpetual motion machine without reference to practical application. 4. In Middle Ages, perpetual motion was conceived largely as form of natural magic to energize automata. In the form of automata, it entertained and amused kings and visitors to royal palaces. 5. During Renaissance, perpetual motion was conceived as a means to supply free power as the needs of society increased. Necessity is mother of invention. During this period, inventors devised many schemes to invent perpetual motion machines using natural forces like water, wind, magnet, capillary force, and above all gravity. We have next volume that examines perpetual motion around Renaissance……..
6.5 Strange and Wonderful, Huge Stone Balls of Costa Rica! 10.7 The "Scoop wheel" or "Tympanum"